Bella Petite’s objective is to produce a high-quality fashion forward online multimedia magazine platform and community portal for all women. Featuring innovative content made up of radio, video and a daily magazine we are the hybrid standard for publishing today. We promote all women with a special highlight emphasizing the petite woman’s (5’7″ and shorter) image in the mainstream media, campaigns and creating real solutions for petite women. Our goal is to enrich and empower the lives of all women by expanding the opportunities in the fashion, modeling, beauty and the business world. At the same time, we are breaking down the negative stereotypes about height, body style, and age. It is time, the fashion industry takes notice and welcomes all women to enjoy fashion! It’s equally important that petite women are represented in a positive and fashionable manner that exposes marketplace identity. 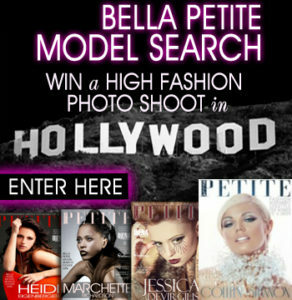 Bella Petite Magazine is dedicated to fashion, entertainment and lifestyle interests of all women. Our mission is to offer real solutions with products and services from fashion to beauty and makeover tools, interactive real-time campaigns with point-and-click purchasing ability direct from the site for merchandise and services. Retailers with products, merchandise and services are able to advertise on our platform to interactively reach women utilizing effective innovative campaigns. In anticipation of a full-scale digital release each year, we have created commemorative anniversary issues of “Bella Petite Magazine,” along with our daily magazine (100% digital) that you may subscribe and join in our efforts. Recently we launched the Bella Petite Model search the only way for petite models and talent to be featured on our covers (12 each year released), or within our in-house editorials that appear in our online magazine. This is a great way for aspiring petite models, talent and “rising stars” to be featured on covers and to have ongoing monthly promotional features. PR firms, managers, and agencies have discovered our magazine and they recognize that we are the leading publication in the industry for petite celebrities and models. By registering their clients as members, they receive regular editorial features, radio show interviews, appearances and new press releases published to our millions of readers. Bella Petite’s global fashion initiative focus is on advocating petite women’s acceptance in the fashion and beauty world. Until now all we have seen is tall and plus-size tall women as the industry standard the smallest segment of women in the world. It is important that we educate petite consumers, retailers, and the media that it is time to fulfill the demands and bring real solutions for the petite women’s marketplace. Founder Ann Lauren created USA Petite’s (a national fashion movement and live fashion events) and now we have Bella Petite Publishing, LLC an extension of those efforts. Ann Lauren and Bella Petite are synonymous to petite women and are the vanguard “petite brands” globally! Bella Petite Magazine community, Ann Lauren LiveCast radio show, Bella Petite Model Search and annual anniversary issues of Bella Petite Magazine. We are committed to discovering and embracing the future of publishing while harnessing the power of a global social community. Our magazine is a full-service outlet of solutions for women from fashion, modeling opportunities, events, television programming, petite model search, retailer and sponsored content, trade events, too real-time campaigns. Bella Petite is helping to change the antiquated industry standards for a more diversity making all women fashion recognizable! I’m interested in modeling but I’m not sure how to go about it. You guys are doing such a great job and this gives me some hope for being a 5’2″ model. Keep up the greak work! Just a grest site to find out lots of info for those of us who are petite & would like to read up to date info & great tips! Thanx so much Bella Petite!